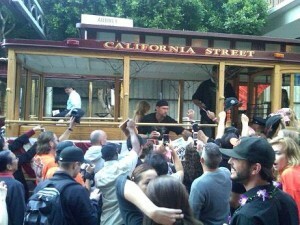 Luckily, I work along the parade route. We’re a block away from the Transamerica building which is where it all started. After the cars, floats, and UPS trucks passed, we went back into the office and watched the rest of it live from our computers and the conference room TV. Wowee Civic Center. Can’t remember the last time I’ve seen that many people congregated anywhere. Estimated 1.5 million. Unbelievable. 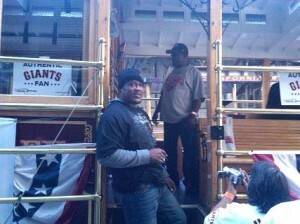 How great are these pictures (taken by a friend of a friend) from the staging area of the parade. Duh! That’s where we should have been!